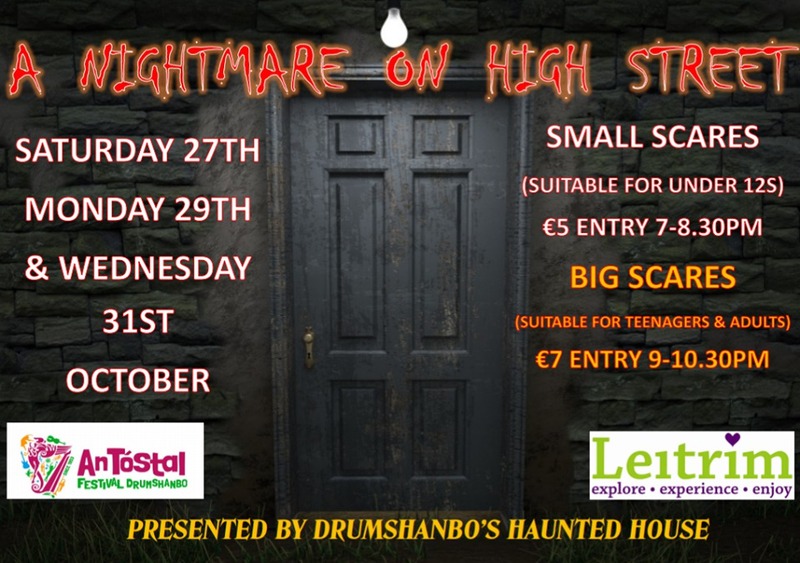 Nightmare on High Street, Drumshanbo - are you brave enough? ‘Nightmare on High Street’ ... but it’s not a nightmare it’s real ...so real and it’s scarier than ever before … it’s the 2018 Haunted House in Drumshanbo Co Leitrim. Last year many many people entered, but with a house that holds confusing passageways that turn and twist, staircases that lead to nowhere, who knows, did they all leave? Who would have thought that a small quiet town like Drumshanbo would have so many haunted locations! This year the spooks, zombies, clowns, monsters, creepy crawlies, skeletons and creatures of an unknown origin have relocated to their new abode on High Street Drumshanbo. The High Street has the most reported supernatural activity in the area. Rumour has it that it has inspired the makings of several horror films and horror stories of men and women who occupy the place and to this day still raid the place for any remnants of drink that can be found. Was it all caused by the supernatural or are there other explanations??? The only way to find out is to come along and see for yourself. The dates for this year’s Haunted House are, Saturday 27th October, Monday 29th October and Wednesday, 31st October. The small scares, suitable for under 12s, run from 7 – 8.30pm admission €5. The big scares for teenagers and adults run from 9 – 10.30pm admission €7. All scares are age appropriate. All those attending the small scares are led by a guide who will ensure that the ghosts, creatures and beasts that lie ahead are aware of the ‘age’ approaching and will scare fittingly. The house is spooky, creepy but loads of fun. For the big scares if you’re big enough then you need to be brave enough! They have many scary rooms in the haunted house, so enter if you dare, but remember it’s called ‘Nightmare on High Street’ for a reason! Keep an eye out for the Leitrim Observer's comprehensive list of Halloween events in Leitrim this week!